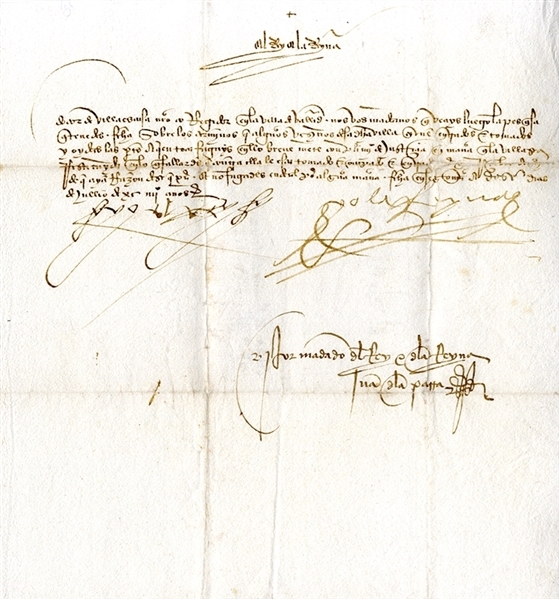 Manuscript Document Signed by Ferdinand “Yo el Rey” and by Isabella “Yo la Reyna” 1pp. quarto, July 12, 1503, and reads “Doctor de Villaescusa, our appointed mayor in the town of Valladiolid. We instruct you to promptly conduct the investigation you have started on the municipal lands that the denizens of the said town have invaded and seized; and that, once everyone’s poistion has been heard, bring swift justice to whoever it is due, so tht the town may receive reparation according to what, in conformity with your findings, ahs been seized and settled. [And see] that nothing might be done [to them[ that they might find further readson to complain. Fine condition. Dr. Alfonso Ramires de Villaescusa served as both an advocate and magistrate in cases of property seizure during the Inquisition’s mass expulsion of Jews and converts. Following the Treaty of Granada and the surrender of the Moors in November 1491, the completion of the Reconquista left the Spanish kingdom in need of reparation. Issued by Ferdinand and Isabella on March 31, 1492, the Alhambra Decree ordered the removal of all practicing Jews from the regions of Castile and Aragon, within a four month span, an edict designed to purge Jewish influence from Spain’s large converso population. The broad expulsion also meant that all monies and property left behind were to be roundly confiscated by the Spanish crown.